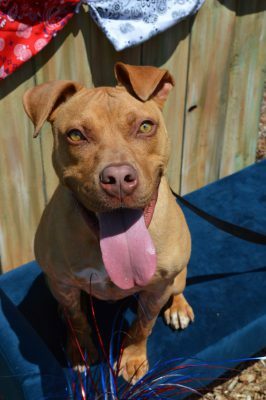 Come celebrate shelter pets with us! The dogs love to party and would love it if you brought a small gift too! The Foundation celebrated the 10 year anniversary of the new animal shelter in June 2016. 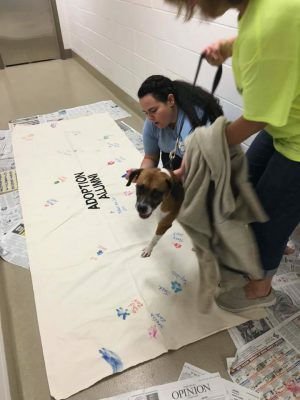 Foundation board member Naomi Webster helps shelter alumni stamp their paw print on a commemorative banner for dogs adopted from the shelter. The Foundation is so happy to be able to provide a safe, clean, and loving environment for the homeless pets of Decatur and Macon County while they await their forever home. 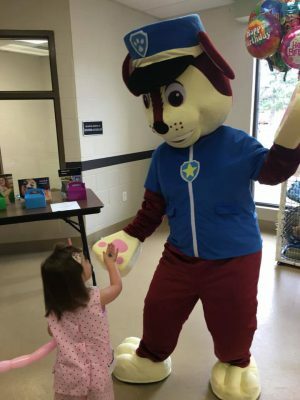 Paw Patrol's Chase makes a guest appearance! The All American Dog Birthday Party is celebrated yearly in June. Our shelter animals frequently come to us as strays so we celebrate all of their birthdays together! We hope you'll join us for light refreshments and to celebrate the all American dog and America! If you choose, the dogs would love a small gift of toys, collars, leashes, or a monetary donation.